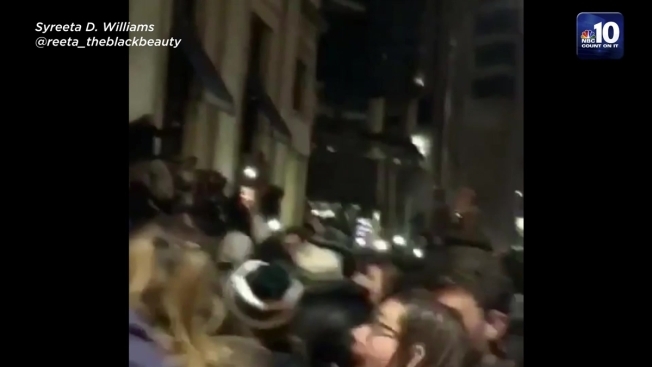 Viewer video shows the moment an awning outside Philadelphia's Ritz-Carlton Hotel collapses after people illegally climbed it during celebrations for the Eagles Super Bowl win. At least a dozen people who climbed on top of an awning outside Philadelphia's Ritz-Carlton Hotel during the Eagles Super Bowl win celebrations toppled to the street when the structure collapsed Sunday night. Videos posted to social media showed fans scaling the vinyl and metal blue awning and then jumping off. Eventually, when a number of people climbed onto the structure at the same time, it folded in on itself. A warning: the video below contains profanity. There were reports of injuries, but police and fire officials could not confirm those details to NBC10. Elsewhere around Center City there were some windows broken and traffic signals torn out of the ground.